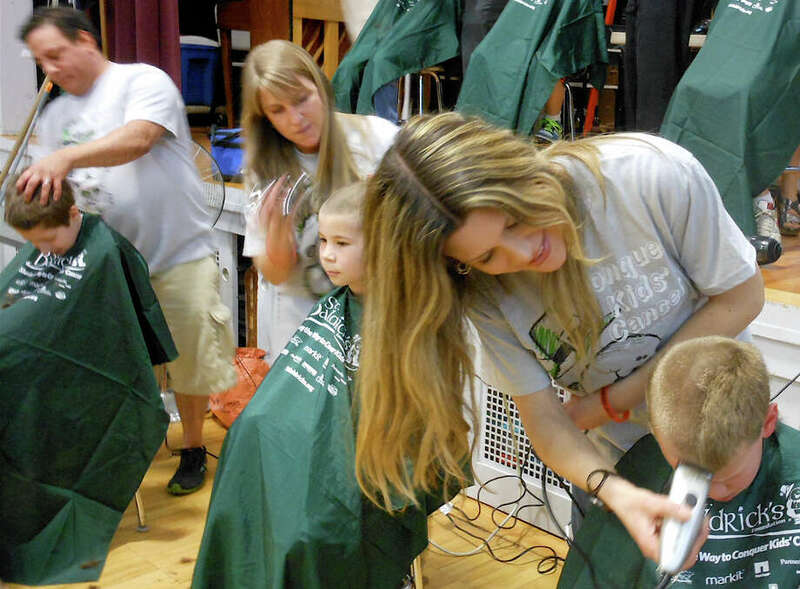 Youngsters get their heads buzzed during Team Teddy's 2012 St. Baldrick's event. This year's fundraiser is Friday, March 20, and proceeds benefit pediatric-cancer research. On Tuesday, it will be a day for the wearin' of the green for St. Patrick. On Friday, it will be the shavin' of the head for St. Baldrick. Team Teddy will sponsor it's sixth annual St. Baldrick's fundraiser on Friday at Osborn Hill School to raise money for the fight against pediatric cancer, organizers said. The event gets underway at 5:30 p.m., and participants who have solicited pledges will have their hair sheared off by a brigade of volunteer barbers. The party atmosphere will include games, face painting, a raffle with more than 50 prize baskets, bake sale and food, organizers said, plus the steady buzz of clippers. By having their hair buzzed tight to their scalps, participants show solidarity with kids left bald by chemotherapy. All proceeds go to the St. Baldrick's Foundation, a California-based nonprofit that funds research aimed at curing childhood cancers. Team Teddy is named in memory of the late Teddy Gerber, a Fairfield boy who was diagnosed with a rare form of pediatric cancer as an 8 year old in 2009 and died in 2010. Anyone interested in being what the St. Baldrick's Foundation calls a "shavee" can register for the Fairfield event online by visiting www. stbaldricks.org and typing "Team Teddy" into the search field. Participants also can simply show up at the event Saturday, organizers said. Anyone wishing to pledge money to a "shavee" or make a donation may do so at the website. Among the more than 50 raffle prizes at Saturday's group shearing are Red Sox-Yankees tickets, a $500 gift certificate to the Westport clothing store Mitchells, a three-month membership to Anytime Fitness and a cocktail party for 20 donated by Susan Kane Catering. The St. Baldrick's Foundation says it is the largest private provider of pediatric-cancer research funding, second only to the U.S. government. Since 2005, it has awarded more than $100 million in research grants, according to its website. For more information about Friday's Team Teddy fundraiser, visit www.stbaldricks.org and type "Team Teddy" into the search field.